Woah there! Hold your horses. We know you’re itching to launch that new website but let’s just take a step back and triple check you’re ready. You might have spent weeks or even months building your site and you are rightfully very proud. But, there are some final flight checks you need to make before you launch. We’ve created a handy WordPress Pre-Launch checklist and INFOGRAPHIC on everything you need to do before you press the button. Follow this and you can launch your website, safe in the knowledge that it is ready for visitors. These are the 25 things you must do before launching your site to ensure success. A broken form can really bring you down..
Is the purpose of the form clear? Will you users understand why they are being asked to complete the form and what they are going to get out of it? Do the form notification and notification emails work? Are your forms working in conjunction with your email marketing tools and ecommerce payment add-ons? The simplest way to test your forms? Fill them in. Leave compulsory fields empty to test the validation and see what the ‘message received’ message looks like. Put yourself in your users’ shoes – there’s nothing more frustrating than a form that doesn’t work or throws those annoying little red error messages at you… abandonment anyone?! Not got forms on your site yet? Check out the excellent Gravity Forms. 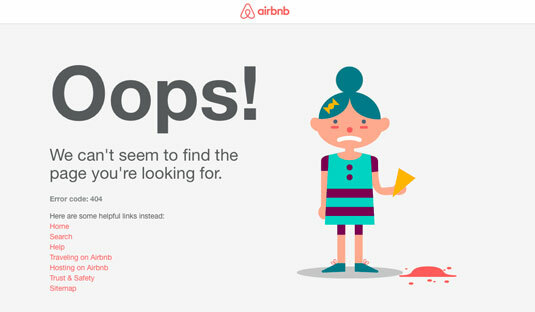 Another no no when it comes to user experience is to not have a proper 404 error page. It’s bad enough as a user to land on the 404. What makes it worse is when it doesn’t give you any help to find the page you were looking for, or for alternatives if that content is not longer there. You need to help your user to find the right page, otherwise they will leave and look elsewhere. You can make the 404 experience better by creating a bespoke 404 page that clearly conveys the error and tell them what they should do next. You can do that by suggesting other sections of your website or by giving them a way to contact you. Most WordPress themes will come with a 404 template. If your theme doesn’t come with one, or you want to customize your 404 page, there are plenty of WordPress custom 404-page plugins out there. DO NOT neglect the checkout process on your WordPress ecommerce site. It could be the difference between success and failure. It is no good hoping that the checkout process will work. You have to test it. And then test it again. It might be boring, time consuming or even expensive to get it right but if you don’t, you are just chucking money down the drain. We’ve all got our favourite browser and it’s likely that you’ve spent weeks building and viewing your website in yours. But believe it or not, there are still some people in the world that use Internet Explorer. Not all browsers were created equal, meaning your website might not look or behave the same way across different browsers, particularly when it comes to images and video. You can manually test your site using the major browsers (Chrome, Firefox, Safari, Internet Explorer, Microsoft Edge) or use a tool like Browsershots or Cross Browser Testing. Perhaps even more importantly is to test your site across all devices. This is something we have all fallen foul of. Your site HAS to work and look good on mobile devices. All of your website’s functionality should work and behave the same on any device. These days, most WordPress themes are fully responsive and some even allow you to view your pages as they would look on different devices, as you are building your site. It’s vital to keep your plugins, themes and your version of WordPress up to date to prevent vulnerabilities that can be taken advantage of by hackers. There are almost 100,000 WordPress security attacks every minute. That’s mind blowing. And hackers don’t care who you are. They will try and break your site. It doesn’t matter what your site is about, how old it is or how many visitors you get. The fact of the matter is WordPress has many weaknesses. And every time one of those vulnerabilities is reported, WordPress works hard to release an update that will fix that issue. If you are not using the latest version of WordPress or your plugins, then you are using software with known security weaknesses. Hackers search for websites running older software versions, so you could become the victim of a sophisticated attack. Add an SSL certificate to your site. Most hosting companies offer one for free. For more information on how to secure your site take a look at this beginners WordPress security tutorial. If you have added files to your site that can be downloaded, make sure you proof read them, make sure the links work and most importantly, make sure they can actually be downloaded. 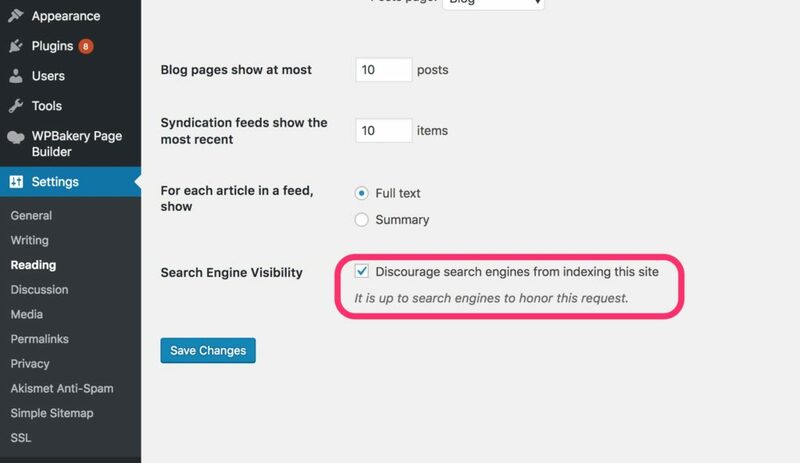 Whilst you were building your WordPress website you might have gone into Settings > Reading and checked the box that says, ‘Discourage search engines from indexing the site’. If the site is under development, you don’t really want Google to crawl your site, or display it in the search results. But, now you’re ready to launch, the last thing you want is to forget to uncheck that box, because Google will continue to ignore your site, not display it in the search results and all your hard work will seem like it has been for nothing. Seriously, if there is only one thing you do every time you launch a WordPress website you must ensure this box is not ticked! Understanding your site’s visitors is really, really important. Google Analytics shows you how much traffic your website gets, where that traffic is coming from, and how visitors interact with your site once they arrive. If you’re building the site for a client, then it’s vital you install Google Analytics. It’s free and so easy to install. If you’re not familiar with the Google Search Console, it is a collection of tools and resources that will help you monitor the performance of your website in the Google search results. You will learn everything you need to know about your website and the people who are using it. Google Search Console will also help you identify technical problems with your website that when fixed, will help your SEO. You need to get your site listed in Google and submitting an XML sitemap will enable that to happen. Put very simply, a sitemap is like a list of all the URLs on your website and when you submit that list to the search engines, you are letting them know that your pages are there, and they will follow the links to crawl and index your site. You can test and add your sitemap through the Google Search Console. If your site doesn’t load almost instantaneously, you’ll lose visitors. People are impatient. They want everything now. And if clicking around your site is slow and laborious, you’ll lose them forever. You could also pay the price in the search rankings. There are plenty of tools out there that will test the speed of your site, analyse your pages and suggest ways to speed your site up. 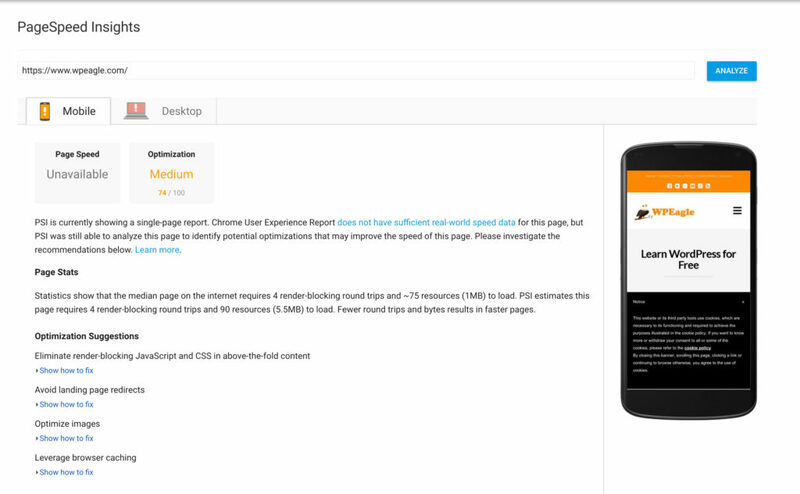 A good one to use is Google Pagespeed Insights. There are lots of things you can do to your WordPress website to speed it up. Take a look at this tutorial for some tips on making your website faster. If you haven’t installed an SEO plugin, do it now! All of your pages, posts, images and videos should have unique titles and descriptions. Your site should have a unique title and description. Make sure your images have been optimized and have a file name, description and ALT tag using your target keywords. Images should also be compressed so that they don’t slow down your site. If you have redesigned your website or have built a client a new website, you will need to redirect traffic from the old URLs to the new ones. A 301 redirect tells the search engines and browsers that a page has moved permanently. This is considered best SEO practice and will ensure that you don’t lose any existing rankings. It can take a little time for the search engines to discover and recognise the new page and credit it with the trust and ranking of the original page. 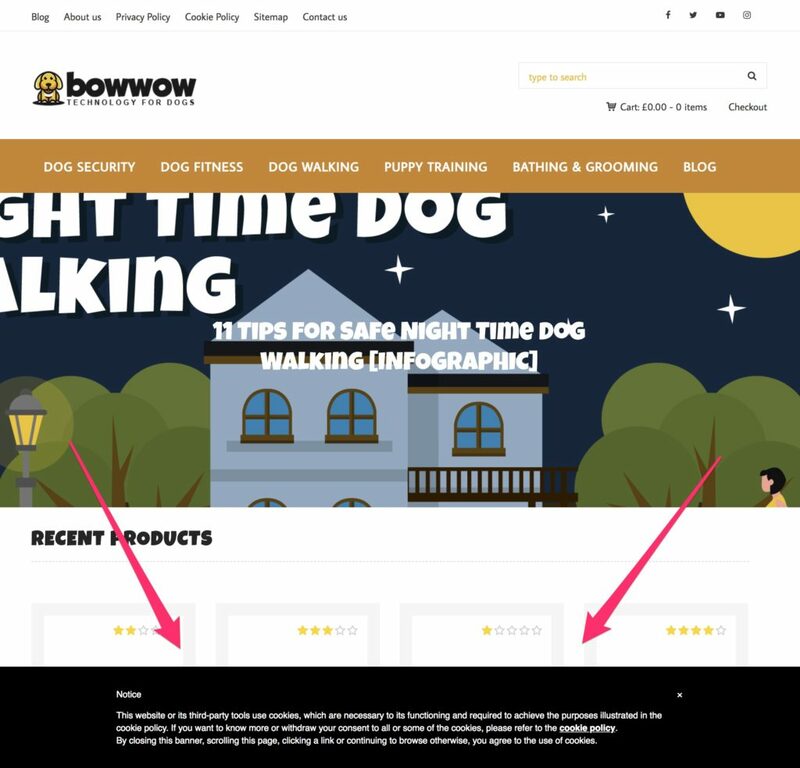 If you used dummy content when you built your site, check and double check that you have removed it and that actual, approved content is in its place. Proofread EVERYTHING! Nothing looks more unprofessional that spelling mistakes and bad grammar. And make sure that your content looks nice and is easy to read and navigate. Use nice paragraphs and remember to use headings and sub-headings. Like with your written content, if you used place holder images, remove them and add actual, approved images that you have the rights to use. Do not use images that you do not have permission or a license to use. If you are using images and video, make sure they link to the correct place or that they work. This can be quite a laborious task, but broken links don’t look good. Make sure all your links work, link through to the right place and that external links open in a new tab. Don’t forget to include your social media and RSS feed when you’re testing your links. It sounds like a trivial matter, but your favicon is a powerful little thing. First of all, it makes it easier for your users to distinguish your website when they have several tabs open. It adds credibility to your site – visitors will notice it and appreciate it and it will ultimately help build your brand awareness. Everyone should get a good experience on your website, regardless of the device or browser they use. And Google use the responsiveness of your website as ranking factor. Your website must be user-friendly on a mobile device. 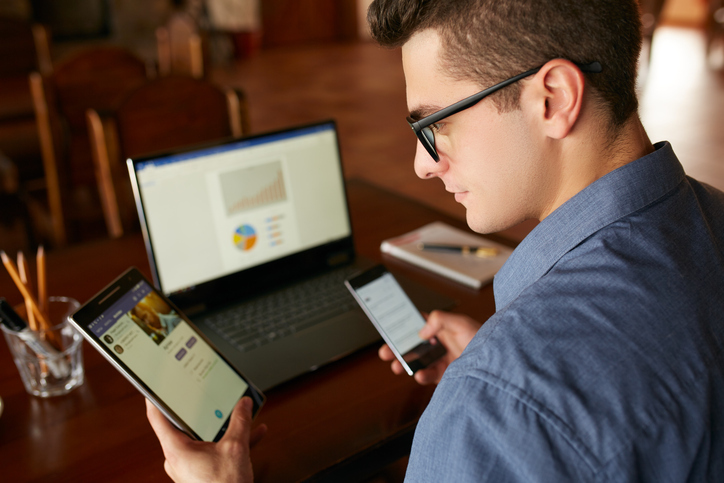 Simply try viewing your website on as many different devices and is as many different browsers as you can. 20. Are You Processing Payments? If you are processing credit and/or debit card payments, the Payment Card Industry Data Security Standard (PCI DSS) was created to help prevent credit card fraud. There are 12 key requirements for business that are accepting or processing payments. This will impact the hosting you have for your website too. Check with your hosting provider that you have a suitable firewall on the server, that if you save credit card information, it is protected, that you have a suitable SSL certificate, your server has anti-virus software on it and that all of your systems are secure and can only be accessed by a limited number of people. By making your website more accessible to anyone with a disability, you are making your website more accessible to everyone, and that can only be a good thing. And it’s not as hard or as specialist as you think. Think about the way your content has been organized. Have all the obstacles to get to your content been removed? Is your content labelled in the most common sensical way? Is it navigable? Think about people who have issues with their sight. Deaf users. Users who have problems with motor skills. Check out the WCAG2 guidelines. These recommendations detail how to make a website interface accessible for all. If you are a registered business, you must display your company details on your website. As well as that you need a set of Terms & Conditions that lay out the legal rights and obligations between you and the users of your website. They should cover copyright ownership, what is acceptable (and unacceptable) use of the website and content and liability disclaimers. If you are running a shop, you must set out your store policies carefully. By setting out the rules that you are your customers must follow when a purchase is made through your site, you could be legally protecting yourself if any conflict arises. Include a disclaimer of liability, warranties, returns and refunds, delivery and any payment terms. It’s a big list but get it right to start with and limit any headaches further down the line. And now you’re ready. It’s time to out your site out there. Deep breath… and go. We’ve taken the most important points from our checklist and created this quick reference launch infographic for you to keep and share. Add this infographic to your website. Just copy and paste the code below.